For this Kwanzaa traditions interview, LoveToKnow Party spoke with Naomi White-Inniss, Director of Multicultural Affairs at American International College in Springfield, Massachusetts. She is responsible for the college's annual Kwanzaa ceremony in addition to hosting Kwanzaa ceremonies at various elementary schools and human service agencies each holiday season. Each day of Kwanzaa focuses on one of these principles. Many of the traditions and symbols of Kwanzaa draw elements from African first-harvest celebrations, and in fact the name was created from a Swahili phrase - matunda ya kwanza or "first fruits." It is a time for learning, reflection and building community. LoveToKnow (LTK): Why do you feel it's important to celebrate Kwanzaa? Naomi White-Inniss (NW-I): Celebrating Kwanzaa is important because the seven principles that it is founded on are a basic guideline for life and future generations. It is also important to have a special time to celebrate and honor the traditions, culture, and history of African Americans. LTK: What Kwanzaa traditions do you include in your Kwanzaa ceremonies? LTK: How would you compare larger community ceremonies and celebrations with more intimate family gatherings? Are there advantages or disadvantages to choosing to plan or attend one over the other? NW-I: There are advantages to both. A community celebration can bring a much larger and diverse group together to foster understanding, meaning, and awareness of its importance. An intimate gathering should also be held as a family tradition that becomes and remains a lived, living and enriched experience passed down to the children. 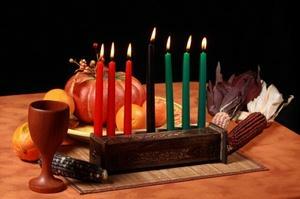 LTK: Do you have any advice or suggestions for someone planning his or her first Kwanzaa ceremony? NW-I: The first Kwanzaa celebration should be simple. It could be a one day celebration or lighting a candle each day to represent the seven principles. Another idea is reading a book on the history and meaning of Kwanzaa for understanding. LTK: Can you suggest some ways to help get children involved in the Kwanzaa celebration and teach them about the importance of Kwanzaa traditions? NW-I: Children can learn, recite, and explain the principles each day. They can light the candles for each day and explain each principle. They can also help make Kwanzaa cards, Kwanzaa items and put up decorations. Children should be encouraged to make dramatic, musical, and dance presentations for the celebration. The Kinara contains seven candles, one black, three red and three green. Each candle corresponds to one of the seven principles of Kwanzaa, the black candle for unity, the red candles for self-determination, cooperative economics, and creativity, and the green candles for purpose, collective work and responsibility, and faith. Celebrants light one candle each night as they reflect on the accompanying principle. LoveToKnow Party extends its thanks to Naomi White-Inniss for sharing her thoughts and experiences with readers. Hopefully, this Kwanzaa traditions interview has helped you learn more about the possibilities for hosting your own celebration this holiday season.